When Should You Invest in a Disabled Shower? When you or a family member lives with a disability or has mobility issues, the first thing that comes to mind is comfort. You think of ways to make your or their lives better and more comfortable. That said, there are two other important factors to consider: safety and independence. Maintaining independence within the comfort of your own home for yourself or your loved one is essential because it can greatly improve your whole family’s quality of life. Independence is not only defined as gaining greater mobility within a given space. Yes, it’s true that you want certain independence to move around without interference from a carer or anyone else but you’re not totally independent if you are full of worry. So independence also means being free from worry. Safety is important to all of us and it is the first indictor that we look to when we are considering replacing a household appliance. If your shower is no longer safe to use due to a family member’s limited mobility then it is time to replace it with assistive technology like a disabled shower. Nowadays, there are many home essentials and improvements that are easily accessible to people with disabilities. There are many ways you can make your bathroom disability friendly. Among these, one of the most important amenities that most disabled people highly appreciate is a disabled shower. Bathing is not just for personal hygiene as it is part of our human nature. It is an element in our daily routine, it relaxes us and it makes us feel good about ourselves. Disabled showers are not only a safe option but they provide comfort and independence. They allow you to fully relax and bath with as much independence as possible. There are many different kinds of disabled showers that fit varied needs. 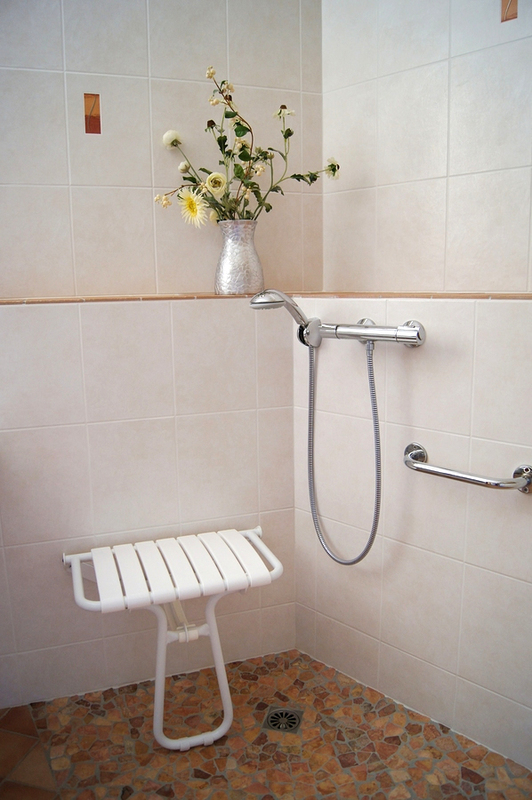 Disabled showers should provide easy access in order to give you the most independence. One of the worries about a normal shower is that the water temperature is not stabilised through assistive technology. This lack of control can mean that a person with limited mobility is at risk of being scalded. Electric disabled showers provide thermostatic temperature stability along with easy to use controls and different coloured and textured covers and parts. This removes the risk of scalding and makes a shower much more disability friendly. Thermostatic mixer showers have valves that go from cold to hot when you turn the water on and this means that you can turn a shower on and have hot water straight away. Some mixer showers even come with controls so you can turn the shower on from your bed and set it to a limited running time. A shower seat is a great addition as it can be used inside and outside the showering area. They come in many different types but some are fully height adjustable. The legs of the seat can also often be adjusted to suit the size and shape of the shower tray. The thoughts that weigh you down whenever you think of providing comfort for yourself or your loved one with disabilities or mobility issues can be eased through the use of assistive technology like disabled showers. Investing in a disabled shower will provide the user with benefits like: comfort, independence and improved safety. If you are unsure of the choices available to you then give us a call and we will happily talk you through them.